China’s presence in the Caribbean is becoming a matter of increasing debate if not concern as more Chinese businesses open in Caribbean towns and villages crowding out locals, and Chinese-funded projects import a majority of Chinese workers at a time of high unemployment in Caribbean countries. Five million Chinese work abroad today; reports say this could rise to 100 million by 2020. The latest debate was triggered by an article in the New York Times of Saturday April 7 entitled: China Buys Inroads in the Caribbean, Catching U.S. Notice. The article focussed on US-China relations in the context of the Caribbean. Among the persons interviewed, my response to a specific question about whether China will emerge as a political force in the region, was: "They are buying loyalty and taking up the vacuum left by the United States, Canada and other countries, particularly in infrastructure improvements. If China continues to invest in the way it is doing in the Caribbean, the U.S. is almost making itself irrelevant to the region. You don't leave your flank exposed". “Q. 1. Do you believe China's increasing presence in the Caribbean feeds into the general uneasiness the US feels about China? A. 1. The US has long regarded the Caribbean as its ‘third border’. It has also jealously guarded against the presence of any major foreign power in the Caribbean because of security concerns. However, China does not fall into the same category as, for instance, the Soviet Union did during the period of the Cold War. China has shown no military interest in the Caribbean. It has not shown any interest in a military base of any kind in the region, and, in this regard, its presence in the Caribbean poses no military threat to the US. Q.2. In your analysis, does China really pose a threat to the US' "doorstep" as is being implied? A.2. At the moment, it does not, for the reasons stated above. However, if China were to expand its interests in the region to the point where it would seek a military presence and particularly a military base, the US would regard that as a threat. For the time being, China is limiting its military activity to Asia and South-East Asia which it regards as its theatre of interest. Q. 3. Does the notion of the Chinese "planting a flag" in the Caribbean, as suggested in the (New York Times) story, suggest that they are looking to somehow replace the US as the influential power in the region? A. 3. 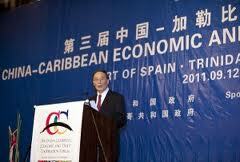 I do not believe that China's interest in the Caribbean is to replace the US as the influential power in the region. China does have an interest in influencing political decision-making on international issues that concern China. Therefore, it would expect the countries to which it is giving support to: (a) not recognise Taiwan as a State; (b) support China on its attitude to Tibet at the United Nations; (c) not support resolutions or any other forms of condemnation of China's human rights record; and (d) support positions in the international community that the Chinese government adopts such as not supporting Japan (which it considers a rival) for a permanent seat on the UN Security Council. China's other interests in the region are economic: it wants access to minerals, oil, gas and forestry in such countries as Guyana, Jamaica and Trinidad and Tobago. China also has trillions of dollars that it has to re-circulate in the global economy so that it gets a continuous return in the future. Hence, it is making loans and investments in projects throughout the region which will give it political influence with the borrowing Caribbean governments as well as help to give it a return on investment. China also has to find millions of jobs a year for its people; it cannot create all those jobs in China alone. Therefore, it insists that Chinese nationals be employed on its projects (loan or grant) in the Caribbean and elsewhere. Inevitably, some of the workers are left behind, and worryingly, the Chinese are providing them with very low cost loans that allow them to buy-out or unfairly compete with locally owned companies particularly in the retail trade which is becoming increasingly dominated by Chinese goods. Q 4. Is there anything immediate that countries of the region should do to somehow safeguard themselves? China’s presence in the Caribbean should not be viewed through the prism of the US or any country’s other than the nations of the Caribbean. China is providing assistance to Caribbean nations for infrastructural and other projects that the United States and Canada have ceased to provide, but the region still needs. The international financial institutions are also unhelpful. A solid co-operative relationship with China is extremely important for all Caribbean countries, but in any relationship between un-equals, the weaker party suffers. The Caribbean collectively is weak enough, but at least in unity it would not be as lame as its individual countries and it could bargain for a more beneficial relationship than now exists. China might also respect them more for acting together.